I had the opportunity to interview producer Michael Uslan (Batman Begins, The Dark Knight, The Dark Knight Rises, Constantine, National Treasure) when he was in New York to speak at the Museum of Comic and Cartoon Art about his memoir The Boy Who Loved Batman (published by Chronicle Books) which chronicles his life and career from young comic book collector to film producer. His latest film, the highly anticipated The Dark Knight Rises directed by Christopher Nolan, hits theaters tomorrow. It was a childhood trip to the local candy store with his older brother Paul that introduced Michael Uslan to Detective Comics and a character named Batman. By the time he graduated high school, he had amassed a collection of 30,000 comic books dating back to 1936. Some of his personal treasures such as Amazing Fantasy #15 (the first appearance of Spider-Man), Fantastic Four #1, and The Hulk #1 just to name a few are each worth five to six figures today, and he purchased a lot of them for a dime apiece. Yep, that’s right, folks. A dime apiece. That includes four pristine copies of Fantastic Four #1 that he was forced to purchase by the crotchety old candy store owner who saw him thumbing through the other three copies to find the best one. That 40 cent shakedown turned into $208,000. He still owns many of those iconic comic books because thankfully, unlike many parents of the day, his mother didn’t throw them out on the condition he also read novels and news articles. But the turning point in his life came on a cold night in January 1966 when a new television show called Batman premiered on ABC. It was at that moment that Michael took his “young Bruce Wayne” vow: he would bring a dark, serious version of Batman to the silver screen. Michael Uslan went on to executive produce all seven Batman films with his executive producing partner Benjamin Melniker starting with 1989’s Batman starring Michael Keaton and directed by Tim Burton. The Boy Who Loved Batman gives the readers Uslan’s first hand account of the steps and roadblocks along the way: from his early days of comic collecting, to teaching the first comic book related college course in America while a junior at the Indiana University, to how he got his first writing assignment for DC Comics, to the ten year odyssey he endured to bring Batman to the movie screen after securing the rights. A comic or movie fan can’t help but be inspired by the stories of his persistence. Michael Uslan signing The Boy Who Loved Batman at the Museum of Comic and Cartoon Art. What is it about Batman that makes him withstand the test of time over 70 years? Uslan: I keep saying it’s these three things: First, It’s the fact he has no superpowers and that his greatest superpower is his humanity. Number two, it’s that primal origin story that transcends borders and demographics and cultures. And number three, he has the greatest super villains in the world. And that is probably the main cause of longevity in this superhero. And nobody can touch Batman’s rogue’s gallery. They just can’t. So I think that’s what keeps him fresh and will always keep him fresh. Who’s your favorite villain in Batman’s rogue’s gallery? Is there a villain that you think has been under represented and should be touched on more in the stories? Catwoman. I think the greatest villainess since the Dragon Lady (of Milton Caniff’s Terry and the Pirates comic strip). Batman’s predilection for bad girls is worthy of exploration through Catwoman. The relationship makes Catwoman a stronger character than she is individually. Two-Face. Scarecrow. I tend toward those psychologically damaged villains more than I do toward a Penguin or a Mad-Hatter. Ra’s al Ghul. I think one of the greatest Batman villains ever created, and nobody really cares for him as much because he was created in the 1970’s after the TV show. So he’s not ingrained in the culture and he should be. Man-Bat. I think it’s a beautiful, dark romance that certainly is a modern day take on Doctor Jeckyll and Mr. Hyde and I find it fascinating. The Reaper. One of the most powerful Batman stories ever told: The Night of the Reaper is probably my second favorite Batman story of all time. Which of the many comic book characters that haven’t gotten the full movie treatment would you like to see on film? My favorite was always Captain Marvel…the Harry Potter of superheroes. It could be spectacular and different, and based on family. The Shadow. His best interpretations outside of print were on radio. I would love to see it visually done in a stunning way. I’m a big fan of the pulps: The Shadow, Doc Savage, things like that. Some of my favorite comic books growing up were Wally Wood’s T.H.U.N.D.E.R. Agents, which to me is like The Right Stuff of superheroes, when they go out and recruit these guys in real life to be superheroes and every power has a curse attached to it. I loved that. Doctor Strange. Fabulous material. The Question. I had a chance to write that with Alex Toth. I was the first writer after Steve Ditko, and working with Toth I never learned so much about graphic storytelling in my life. That was fun. That’s another character I have a soft spot in my heart for. That pretty much sums it up. What is your take on the current state of comic books? In the 50’s, 60’s, and 70’s the stories were more about adventure and now the storylines seem geared more toward the internal turmoil of characters vs. going out and fighting the bad buys. In your opinion how do today’s comics measure up to the comics of your youth? A world apart. Comic books when I was a kid were aimed at 7 to 12 year old boys and today’s they’re aimed at adults. And in too many cases kids are ignored, and so are women. And for awhile it was Manga that was filling that gap. And I’m happy to see comics become a little more diverse and opening the doors again to kids and females which is important. Technologically the comics are completely different. The graphic storytelling has changed. One of my pet peeves is when I open up a $3 or $4 comic book and there’s an average of seven words on a page. It’s called a comic book. It’s supposed to be art and words mixed together and not having the words abdicated entirely to the artist. So I like my comics to have more meat on them in terms of their literary value. You’re right, this started with Stan Lee with Marvel Comics when he began to create conflicts based on internal conflicts more than the external conflicts of super-villains or aliens or whatever. And that it became more important as a Marvel reader what was going on in Peter Parker’s life and in Spider-Man’s life. The torture of the Hulk, the military industrial complex, science gone mad, but it was that switch over to the internal conflicts. And now I think today that is the rule rather than the exception, even with the villains. When the villains come in they are internally conflicted and the relationships between the heroes and the villains, the symbiotic relationships, are explored opening doors to make it feel more mature, to make it feel more real to a much older reader. But the days when I picked up a comic book to be entertained for pure escapism, it’s not quite the same. And sometimes I feel I’m weighted down by a lot of them and other times I feel they’re inappropriately dark and gritty just to try to keep pace with what everybody else seems to be doing. And the movies can make the same mistake. You can’t have the dark and gritty Superman. You can’t have the dark and gritty Ant-Man. And for God’s sake you can’t start making Casper the Unfriendly Ghost. If you were to make a Batman movie in the 1940’s what talent would you put together for that project? You took an idea you had as a teenager and not only made it your life’s mission, but made good on it by producing all seven Batman films starting with Tim Burton’s Batman in 1989. In your book you describe the obstacles you faced for ten years trying to get the film made. Where did this persistence come from? Passion. If I had to boil my life down to one word, it’s “passion.” I was raised by an amazing woman who not only let me keep my comic books, but brought up my brother and I in a way that once you make a commitment, you honor it. Period. End of story. You’re not happy? You’re sad having to be on this little league team because you hate your coach? I’m sorry but you made a commitment to the kids on your team and you have to see this through. Next year you don’t have to do it, but you made a commitment, you see it through. I made a commitment to bring a dark and serious Batman to the silver screen. I thought it was going to be a breeze. It wasn’t. And I’ve learned since that I can accomplish anything I want to in life, but always the longest, hardest possible way. There was never an easy path for me. There was never a quick path. You look at the other movies I was involved with: Constantine, National Teasure. These movies have taken nine, eleven years to bring to the screen. So I’ve always got there but never the easy way. And so I have a bit of a siege mentality as a result. I don’t expect anything less than agony (laughs) and duration to get to where I want to go. But I so want to get to where I want to go that I’ve learned how to channel that frustration and deal with it and not let it beat me. A very special thanks to Michael Uslan for taking the time to meet with me for this interview, and to the Museum of Comic and Cartoon Art for the opportunity. Please note this interview, and all original content on FantesInferno.com is copyright Fabrizio Fante and FantesInferno.com and cannot be copied or used on any platform or in any format without expressed written consent. Willem Dafoe in THE HUNTER, a Magnolia Pictures release. Photo courtesy of Magnolia Pictures. Willem Dafoe’s latest film The Hunter is one of three current releases for him along with Disney’s John Carter and the independent film 4:44 Last Day on Earth. The Hunter, directed by Daniel Nettheim, tells the story of Martin David, a mercenary sent to the forests of Tasmania by a biotech company to hunt what is believed to be the extinct Tasmanian tiger. As Martin scouts the terrain, he is drawn into a local conflict between loggers and environmentalists, and helps struggling mother Lucy Armstrong (played by Frances O’Connor) whose environmentalist husband has gone missing. The film also co-stars Sam Neill (Jurassic Park, The Dish). Dafoe met with the press for a round table interview on March 14 in New York to discuss the film, hunting, and his approach to acting. Do you have a background as a hunter? Was that the week you decided to start acting? (laughs) Yeah, something like that. What surprised you the most about filming in Tasmania? And also could you compare and contrast your experience with working in the jungle to this movie and say a movie like Anti-Christ where you were actually being hunted. In Tasmania, the weather was really volatile. It could be snowing and really cold and two hours later it could be sunny and warm. I mean, a lot had to do with elevation but we were moving around a lot. So the weather was brutal and obviously, particularly for the sequences when I’m out in nature, I’m playing scenes with the weather, I’m playing scenes with nature. It’s a powerful thing when you’re filming because you can’t control it so you have to be flexible and you have to invent things, and you have to know the story you want to tell, but you have to make adjustments all the time. So it has all the energy and curiosity and problems of an expedition. So I’m out there with a small crew, so on some level it kind of mirrors the hunt for the tiger. I’ve been in the jungle a lot through the years and you know, jungles when you really get down to it, they’re all the same. Nature gone wild. In the spirit of your character, did you keep a distance between yourself and the children in the film (Morgana Davies and Finn Woodlock)? Well, not so much on the set, but actually in the scenes because naturally they’re kind of sweet. They’re actors, but they’re kids first. And they don’t have – even though Morgana (Davies) the little girl has done some films and people really like her in films, it’s not like they have traditional actor skills of repeating things so when you’re playing these scenes, you’re tricking them into things and in that job you can get sucked into a sweetness. And I just found myself feeling kind of a paternal urge happening, and I thought “Boy, we gotta nip any sentimentality in the bud.” So I was very conscious of that. You don’t want to muck it up, you know? If you get too soft then the ending’s never gonna land. And when you were a cut off, isolated hunter with no human connection does that affect you when you’re not working? Do you feel strange or different? Or can you just shake it off at the end of the day? The funny thing is I feel that as I get older I’m more affected by roles. I used to say when the camera turns off the character goes back inside me. But I feel like that’s less true. In a role like this, all I’m doing is filming. I’m working long days, and there’s nothing else. I’m just doing very little besides that. So of course, just by sheer immersion the character starts to haunt you and becomes you for a period of time. Particularly when you’re working in a location where all your normal habits are broken and you have nothing to remind you of who you are normally, and we were working in quite remote areas. So what I’m dealing with is I’m applying myself to a fiction in a funny way, and you’re inviting yourself to be flexible. You’re inviting yourself to transformation. So it can run really deep, but not in a scary way. Does it take away the joy of being an actor? No, that is the joy of being an actor. I mean, the joy of being an actor is taking on someone else’s point of view and someone else’s circumstance, getting the shift of perspective. That’s what I like about film in general is when they just by kind of learning or seeing something new, you go ‘Man, you know I never thought of it that way.’ Or you say “Oh, I always thought this was this, but it’s really this.” As an actor you actively get to do that. You have empirical evidence, it’s not just an intellectual shift of point of view. It runs deep, you experience it. And that’s a beautiful thing. Magnolia Films’ The Hunter is currently in theaters. Daniel Nettheim, director of THE HUNTER, a Magnolia Pictures release. Photo courtesy of Magnolia Pictures. Australian director Daniel Nettheim helms the new film The Hunter, an environmental thriller adapted from Julia Leigh’s 1999 novel. Academy Award nominee Willem Dafoe (Platoon, The Last Temptation of Christ) plays Martin David, a mercenary sent to Tasmania by a mysterious biotech company to hunt what is believed to be the last Tasmanian Tiger in existence. Along the way Martin is drawn into a local conflict between environmentalists and loggers, and against his nature helps struggling mother Lucy Armstrong (played by Frances O’Connor) whose environmentalist husband has gone missing. The film also stars actor Sam Neill. I had an opportunity to participate in a round table discussion with Nettheim to discuss the film, working with Willem Dafoe, and the challenges of shooting in Tasmania. The questions below were asked by the group in attendance. How close to the book did you want to keep the script? There were things in the book that I definitely wanted to hold on to, which were things that attracted me to it in the first place. So we held on to the premise, we held on to the characters, we held on to the locations, we held on to the tone, we’ve held on the essential dramatic arc, and what we’ve changed is certain aspects of the ending, and we’ve really had to find ways to externalize the drama. Most of the book was a man alone in the wilderness and it was all inside his head. As a filmmaker that’s not so easy to do. In the film, the Tasmanian vistas are absolutely breathtaking. As a director did you find the terrain incredibly challenging to work in? People had warned me that the weather can change, you can get four seasons in one hour. The cinematographer had worked there before and he said to me very early on, to forget any notion of continuity of light across a scene. For that reason we kind of deliberately didn’t have long two hand dialogue scenes in the exterior because you can start it in the sun and you’ll finish in the rain. The snowstorms you see in the film, we were hoping to get snow, but that snuck up on us. That morning was sunny. We saw the clouds come in at lunch time and half an hour later we had snow. So I just had to quickly say, “Alright guys, let’s quickly scrap this afternoon’s plans. We’re going to shoot the snow scenes.” So as a crew we had to be very adaptable and responsive to the weather because it’s one thing you can’t tame. As filmmakers you try and control everything as much as you can. But the weather, particularly in Tasmania, we just had to roll with the punches. And for that very reason, when we’re talking about Willem’s wardrobe, we decided that when he’s out there hunting, he’s only going to have one outfit. That way, not only can we quickly change what we meant to shoot to respond to the weather, but once I was in the edit I could move anything anywhere and it would fit. There seems to be a trend in films recently like The Grey and other similar films with regard to man vs. nature. What do you think this film really speaks to thematically to that man vs. nature story? It’s interesting because it starts off as a man vs. nature story and ends up as a man vs. himself kind of story in a way. This is a man whose work involves trying to be at one with nature, it is a hunter. And as part of Willem’s training for the film we learned techniques like how to move across the landscape so animals don’t hear you, how to use what’s around you to build your traps and snares. So it’s kind of paradoxical because he’s at both one with nature – he understands nature, he thinks like an animal – but his business there is essentially very destructive. So what we wanted to speak about was really the uneasy relationship that has always existed between mankind and the natural environment. This story of what happened to the Tasmanian tiger is a great kind of historical case in point, but that story is continuing with the battle to save the native forest which you see in the film, and the conflict that’s going on between the loggers and the environmentalists. Is Willem Dafoe the only actor you had envisioned in that part of Martin David? He was so perfect for it. He was the only actor we approached. I had envisioned him in the part from quite early on in the writing because it’s helpful to have a face in mind when you’re writing scenes. There was a list of people, but fortunately Willem said yes. What are your thoughts on Willem’s take on the character? One of the things that was strong in the book was this character had for whatever reasons, shut himself off from experiencing human emotion in a way. He was a character who was assumed to be most comfortable when he was alone in the wilderness. I identified with aspects of that, sometimes I like to get away from people, it’s great, but I found a way to function in society and most people do. This character chose not to. And Willem and I didn’t talk about what pain he might be running away from, what might have been happening to him to make him like that. We didn’t investigate that part of the psychology, we just took it as a given that he’s a man that’s very closed off but over the course of this story he begins to open up to the possibilities of another way of being. And look, it does cause him incredible pain, incredible loss. But that is part of the human experience. Did you have any conflicts with Willem on set in terms of the vision of how you think the movie should be? Did you lock horns at all? No, we had a mutual understanding of the character and we worked all that out in pre-production. I invited Willem’s input on the last draft of the script. So the character stuff was clear and most of our work on set was about matching up the expectations of the scene on the page as compared to the physical realities of where we were. Ok, it says, “Martin lays a trap.” What’s that going to look like? Where’s that going to happen? Which parts of the setting of the trap are we going to see? What parts does he need to learn? There were moments where his instinct for the character contradicted what I think the scene needed for the story. And he respected that. We would find a way to get both. But I kind of figured he should take ownership of the character, he should protect that character, and I’ll just keep my eye on the story and the big picture, and we’d work together to make that happen. Was it quiet crew? Was it a small band up there that was trying to get him to feel as isolated and alone as possible? We were a pretty lean crew. We didn’t have big trucks. All of the lighting and grip gear could go on the back of a couple of utilities [trucks]. Usually we could drive to within a hundred meters of where we had to shoot. But Willem, that’s where acting really came into it, he didn’t have to actually be totally isolated to feel the part. However, he did insist on doing everything himself. He had a backpack that was always weighted, and he would not be doubled. There’s helicopter shots where you see a little speck, and that’s Willem. He wouldn’t let anyone else do it. Some of the most spectacular helicopter shots, he had a walkie talkie. There was an assistant hiding in some trees or in some bushes somewhere. He couldn’t see us. We were in the helicopter going, “Okay we’re coming up over the hill, come towards it.” And he’d be like “Which hill, I can’t see it.” We’d say, “Just keep walking,” and he would. The ground was incredibly difficult to walk on. He was deep in mud, there was leeches, and these buttongrass tufts are really hard to navigate. He was a real trooper. The things he did for authenticity I was impressed by. Could you talk about Morgana Davies who plays Sass in the film. She’s a real scene stealer. What was the casting process like for that role? In the film, you used real footage from the 1930’s of the last Tasmanian tiger. Was it difficult to get permission to use this? That footage wasn’t difficult to get a hold of. It’s quite famous footage. There’s maybe eight or ten minutes of footage in existence in the world of the Tasmanian tiger when it was alive. That footage was partly owned by the Hobart Museum and partly owned by the National Film and Sound Archives. One frame belongs to someone, and one frame belongs to someone else. So we had to go to both bodies for permission. When they sent us up what they said was the best quality master available, on an HD cam or something, it was really bad quality. It was a very low res digitized image. And this was the coup: we got them to send us the original 16mm print, made a new High Def digitization of it. And no one’s ever seen it projected like that before since the 1930’s. Did you have a personal connection emotionally with the Tasmanian Tiger? I had a personal connection with the landscape more than anything initially. The descriptions in the book were really beautiful. I knew that landscape a little bit because I traveled a bit in Tasmania. I knew it was a place that hadn’t been filmed much. It’s hard to have a sentimental feeling about general animals – kangaroos, wallabies – which are hunted for meat and for sport in Tasmania. But the Tasmanian Tiger itself, it’s become part of our national mythology. There’s a great sense of national guilt about what happened to it, and I think this myth that goes on that it still might be alive in a way is kind of a dangerous one because it lets people off the hook in a way for that kind of destruction. But I think it’s also become symbolic of the way that progress can decimate nature. Do you think there really can be some type of balance between the industrial side and the environmental side in that area? I think there can. In areas like that in the U.S.and else where there are plantation forests, a sustainable timber industry. And in Tasmania, one third of the island is world heritage area or national parks. It’ll never be touched, but where the frontline of these battles is there’s these borders, the perimeters of these national parks, that are constantly being shifted. The government is constantly allocating little sections to the logging companies of these old growth forests which will become toilet paper for the Koreans, literally, and never exist again. But that’s the front line of this battle, and it’s very heated. You go down there and it’s a very, very emotional debate. We spoke to people on both sides, they were all very articulate. We were clear that we wanted to depict both sides as characters in parts of the story and we wanted to make sure we were presenting them in a fair way. Obviously I have my own feelings about that kind of conflict. There was a point where there was close to some kind of truce when we were down there, but I think it flared up again. What would you say would be the most important thing you learned as an independent filmmaker making this film in Australia, and what advice would you have for filmmakers that would want to work in this type of environment? There were pluses and minuses. One of the things that really worked in our favor was the story of the film was very contained. There was the house, there was the pub, and there was nature and a couple of other small locations. So it was achievable. We got a lot of support from the state of Tasmania who wanted us to come down and present their landscape in a way that would encourage tourism, and it’s worked for them. The budget was very lean, as they always are. But we couldn’t make that film without Willem Dafoe. Which is a paradox because we had the Australian actors union going, “How dare you bring in a foreign actor.” In Australia we receive foreign subsidies to help finance cinema. All our films get government subsidies, but we’ve got the government saying you need to make films that are going to be exported overseas. It has to play overseas for foreign audiences. So it was fortunate that we had a character who was an outsider. It allowed us to cast someone like Willem who could bring a name to the project but not in a cynical way. It was right for the character that he play it. So yeah, casting was critical, and making sure that all of the money was on the screen. None of us got paid much, but we wanted to make sure that every cent we spent translated to some amazing landscape. Up until the last week we weren’t sure if we could afford the helicopter shoot. The producer would say, “If you’re going to do overtime today, you’re not going to get your chopper.” So it was very lean but the chopper was important because it really just opened up that world. Magnolia Films’ The Hunter opens in theaters on Friday April 6th. Independent film director Abel Ferrara (King of New York, Bad Lieutenant) uses New York City as the backdrop for his latest film, the apocalypse themed drama 4:44 Last Day on Earth. The film stars Willem Dafoe (Platoon, John Carter) and Shanyn Leigh (Public Enemies, Go Go Tales) as Cisco and Skye, a New York City couple reflecting on their lives and relationship on the eve of the end of humanity. Ferrara sat with journalists for a round table discussion in New York. What was the significance of the time 4:44 for the end of the world? Shanyn (Leigh – lead actress) is a numerologist. 4:44 has a very heavy Chinese meaning. Four means death. That’s a heavy meaning. There’s that point in it, that 4:44 means death. They may have to change that title in China. But at the same time the film is in New York. 4:44 is only on the East coast. The world is going to end at 1:44 in Los Angeles. And the world is going to end at 10:44 in the morning in Rome, right? In New York the bars close at 4. It’s almost 4:44 is the time like if it’s not happening by 4:44, go home. At what time is the night over? Is there a part of you that truly fears the end is coming? I don’t know about personally fearing it, I can accept it. There are much more advanced civilizations than us that have gone down. One thing I want to make sure of with this film, this wasn’t a meteorite hitting the earth. This was due to man’s destruction of what is out there. You can buy in to Al Gore’s idea, you can dismiss it. You can say, because a bunch of hackers come up with a bunch of fu**in’ e-mails that might or might not be real. You know, there’s a lot of words going back. But it’s like the Dalai Lama says in the movie, we don’t control nature. If we don’t understand we’re part of nature and that if we think we can abuse it and not use it. You’re going to be in for a surprise like the people in Easter Island and there’s a lot of other civilizations, too. Where would you want to be at the end? I think that film is pretty much what I would be doing. I mean, I’m not going to go to Times Square and watch the ball come down. (SPOILER ALERT) At certain points in the film you showed a disturbance in the atmosphere. A disturbance of wind. Because outside in the wind there’s a disturbance of the atmosphere. If the ozone is protecting us from the rays of the sun, and the ozone is gone, then that’s it. These kinds of films are not scientific documentaries. I had my guy from Stanford, and he said, “Listen, go with the Twilight Zone.” We’re dealing with fiction. I just wanted to make sure it came from the earth. What would happen if we didn’t have the ozone protecting us from the sun? It would be like you’re in a f**king, you know, microwave. How painful is that gonna be, I don’t know. The film isn’t about that. Come on, look outside today, it’s March. This is f**kin’ March. Sure, you could say, “Okay, it’s just another day.” You know, come on. (SPOILER ALERT) In 4:44 there was a very strong theme about sobriety. I’m drinking water, so it really was about that. Obviously he’s in the program, Willem (Dafoe’s character in the film Cisco). He’s counting days. And then came that moment. He came to the drug dealers obviously to score and then he bumps into this cat with 20 years sobriety. So the point was, was he going to get high or wasn’t he going to get high? What neighborhood did you grow up in? I was born in the Bronx, and I grew up in upstate New York. The neighborhood I came from was very Italian and very protected. It was very dangerous in a way of white street gangs when I was really young. But then I moved away from it. But then I moved to a town that was like the crack capital of New York, Peekskill. What are your thoughts on how New York’s changed in the last 20 years with all of the cycles the city goes through over time? This city has changed. It became very much international. It started with Giuliani, it became very much focused on the money. It’s become an international financial capital, which it’s always been. But it’s spread from just Wall Street and neighborhoods like here (midtown) to almost all of Manhattan. So if you want to go to Manhattan you gotta go to Brooklyn now. Brooklyn is the new Manhattan. 4:44 Last Day on Earth is currently in theaters. 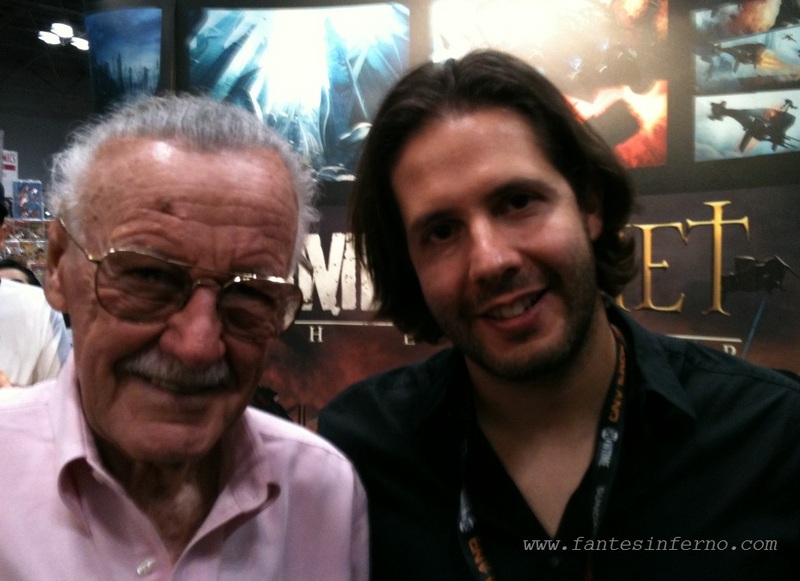 Comic book publisher and icon Stan Lee and 1821 Comics co-founder Terry Dougas unveiled their latest graphic novel Romeo and Juliet: The War at the 2011 New York Comic Con. The hit stores January 25th, is Shakespeare’s classic Romeo and Juliet reimagined as a sci-fi fantasy set in the future. It was written by Max Work with artwork by Skan Srisuwan. 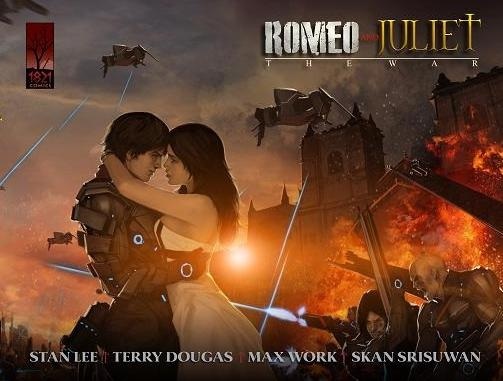 ROMEO AND JULIET: THE WAR takes Shakespeare’s star-crossed lovers and places them in the futuristic sci-fi/fantasy Empire of Verona, the most powerful territory on Earth. The MONTAGUES, powerful cyborgs made of artificial DNA, and the CAPULETS, genetically enhanced humans known for their speed and agility, worked in tandem to destroy all threats to the city. With no one left to fight, the Montagues and Capulets found themselves a new enemy: each other. I caught up with Lee and Dougas on the first day of the New York Comic Con. What was the genesis of this particular project and how did you get involved? Lee: Actually Terry Dougas came to me one day and said, “Why don’t we do Romeo and Juliet and update it?” And I loved the idea. He decided if we set it in the future, the Capulets and the Montegues can each have a superpower. And when they fight, it becomes the kind of story that superhero fans love to read, but we tried to keep all of the ingredients and all of the elements of Shakespeare’s Romeo and Juliet. So hopefully if you’re a Romeo and Juliet fan you’ll love it, and if you’re a superhero fan, you’ll love all of the excitement and the superhero stuff that’s involved in the story! Dougas: It’s just cool to set in a different environment for everyone to see. Because I knew it took place back then, of course, but setting it in a futuristic environment with all of these gadjets, all types of audiences can read it or watch it. We kept the skeleton, we just made sure we respect the original piece of art. How is the process working together? How it is working with Terry, and how is it working with Stan? Dougas: He is such a diva. (laughs). Lee: It’s great working with Terry because I can brow-beat him. I yell at him. (laughs). No he’s a great guy. He has more ideas and more enthusiasm than anyone I’ve met in a long time. I mean every time I talk with him he comes up with something new. I thought I was creative, but I’m learning from him! Dougas: For me it’s been an honor. I grew up in Greece reading his comics, it’s just an honor. I learn every day, he helps us with the company and the ideas also. And every couple of weeks we brainstorm and figure out a way to make it the way we want to see it and read it. That way we go to bed happy. Hopefully everyone likes what we’ve done, that’s why we’re doing it as a big hardcover book, 10” by 13” and give enough to the readers to hopefully satisfy them and pay homage to Stan Lee and Shakespeare. Lee: I never knew anybody that put so much of himself into a project. The average publisher would just publish a book, promote it a little, but this man [Dougas] has been working with this, and living with it, and making posters, and setting up meetings and designing statues. He puts everything into it which I think is wonderful. What medium was used for the artwork? Was it done mostly with computers or traditional pen and ink? Dougas: Mostly computers. This artist, Skan Srisuwan, is a great artist. It took us a long time to find him. We went through 200 artists in order to find him in Thailand where he’s working. But he’s amazing. The cover (of the book), he did that in 48 hours, which is incredible. The hardcover book is 155 pages, so you can imagine how much work when into it because all of the panels have the same look to them. We had to make sure it’s the absolute way we wanted it to come out. Do you think this is the future of comic publishing? Moving away from pen and ink? Lee: More and more the artwork in comic books begins to look like illustration and is computer aided if only in the coloring. But I think there will always be a place for the regular pen and in drawings. People love those, too. Any hints on your next project after Romeo and Juliet? Romeo and Juliet: The War debuted at #7 on The New York Times Best Sellers list on both the hardcover and paperback graphic books best-seller lists. Special thanks to Theo Dumont of Dumont Marketing for the opportunity to interview Lee and Dougas. 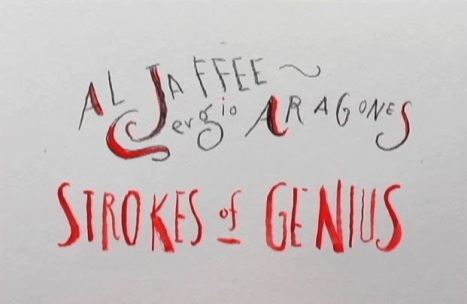 In 2010 one of my passion projects, Strokes of Genius, launched on SundanceChannel.com. 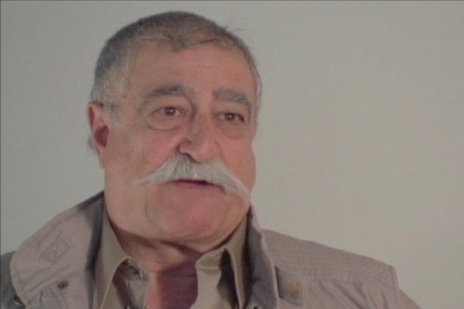 The web series consisted of four short video interviews with legendary Mad Magazine artists Al Jaffee and Sergio Aragones. Jaffee is best known for the Mad Fold-In, which he still paints by hand month by month since the mid-1960s. Aragones’ A Mad Look At… is a perfect storm of both his incredible cartooning skills and influence from pantomime in these non-dialogue classics. The series was directed by the incredibly wonderful Gail Levin (who recently directed two episodes of American Masters for PBS on Jeff Bridges and Cab Calloway), hosted by New Yorker artist Steve Brodner (who drew and painted the on-camera artwork), and animated by Asterisk Animation (now Ace and Son). It was my first producer credit for SundanceChannel.com and I owe a huge thanks to Jeff Kunken for that opportunity. All four videos can be seen here. 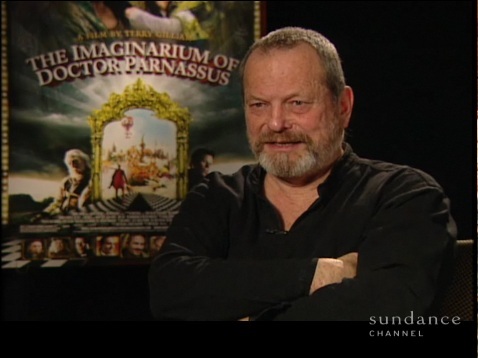 In December 2009 I had the honor of conducting an on-camera interview with cinematic genius and Monty Python alumnus Terry Gilliam to discuss The Imaginarium of Doctor Parnassus for SundanceChannel.com. In the weeks leading up to the premiere, Heath Ledger’s death during the production of Parnassus dominated the press coverage. My line of questioning focused mainly on Gilliam’s creative, casting, and production processes but inevitably led to a question of how he was able to complete production of the film after Ledger’s untimely death. Sensitive to this, I kept the question based on how it affected production, rather than ask Terry to repeat (as he already had in other interviews) what went through his mind when he first heard that Ledger had died. A special thanks to Terry and the camera operator who kindly gave me some additional time for some non-Parnassus questions that I hope to include in future posts. All three parts of the interview as well as press clips from the film can be seen here. Here’s a link to a Woody Allen press conference I covered for his film You Will Meet A Tall Dark Stranger as Sundance Channel’s “Kultur Kritic” in 2010. The film, starring Josh Brolin, Naomi Watts, Gemma Jones, Antonio Banderas, Anthony Hopkins, and scene stealer Lucy Punch (also seen in 2011’s Bad Teacher), was Allen’s “poignant mixture of angst, uncertainty, and delusion.” Yep, those were my words. Alfie (Hopkins) leaves his wife of forty years, Helena (Jones) to marry twenty-something call girl Charmaine (Punch). Helena copes by turning to the services of a charlatan psychic (Cristal), while her daughter Sally (Watts) struggles in her own rocky marriage to a floundering writer, Roy (Brolin). Both develop feelings outside of their marriage, Sally for her boss Greg (Antonio Banderas) and Roy for his neighbor Dia (Freida Pinto). What ensues is the usual brand of quippery, fun and drama. Photo credit: Iole Capasso / Squeezed Heart Productions. 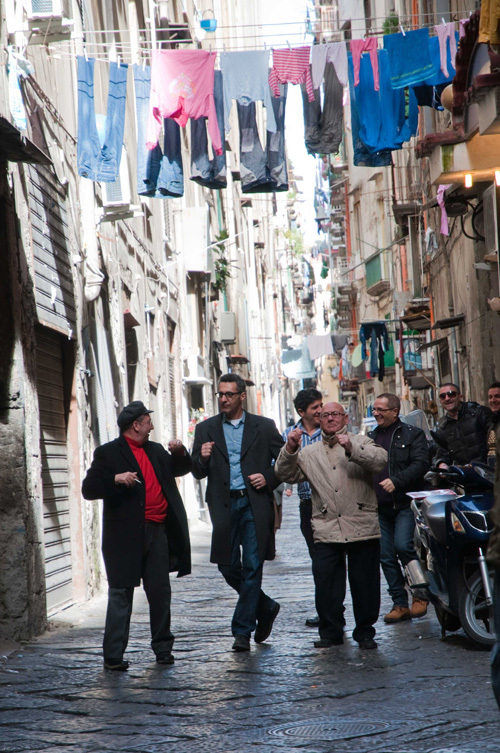 In June of 2011 I sat down with John Turturro to discuss Passione, his “musical adventure” through the beautiful and mysterious city of Naples. The film, his fourth as a director (Mac, Illuminata, Romance and Cigarettes), is told with 23 songs by contemporary Italian musical artists. Our conversation also touched on his musical influences and his relationship with the city of Naples. Passione is currently available on Blu-Ray from Amazon.